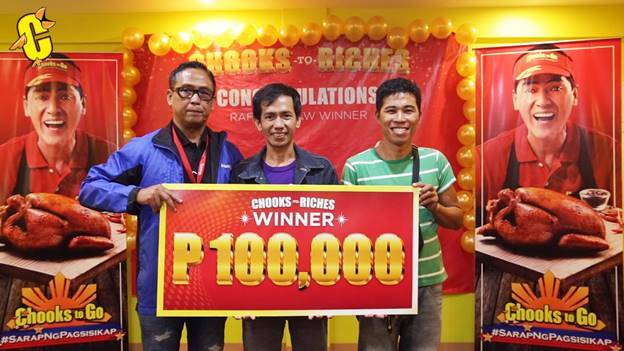 Chooks-to-Go, the leading roasted chicken chain in the country, recently announced the nine winners of Chooks-to-Riches, its ongoing nationwide promo. The winners are John Jervie Dee of Misamis Oriental, Emanuel Moreto of Leyte, Angelica Olinares of Negros Occidental, David Villanueva of Bicol, Leslie Naval of Malabon, Antonio Tiu of Tacloban, Emmanuel Asuncion of Bulacan, Ma. Elena Biyo of Iloilo, and Cecile Senining of Cebu. Each received PhP 100,000 pesos in cash, tax-free. “Hindi ko po inakalang isa ako sa mananalo. Sa dami ng customers ng Chooks-to-Go, ako pa ang ma-swerteng nanalo. Masayang-masaya po talaga ako, malaking tulong po ito sa amin,” said Emanuel Moreto. “Nagulat po ako nung may tumawag sa akin na taga-Chooks-to-Go. Nataranta po ako nun kasi hindi ko matandaan kung naitago ko yung resibo na nanalo. Maraming beses po kasi akong nagtext. Blessing in disguise po itong pagkapanalo ko at napakalaking tulong sa aming pamilya,” said Antonio Tiu. Angelica Olinares, one of the winners of PhP 100,000, with her family at BAVI Bacolod. 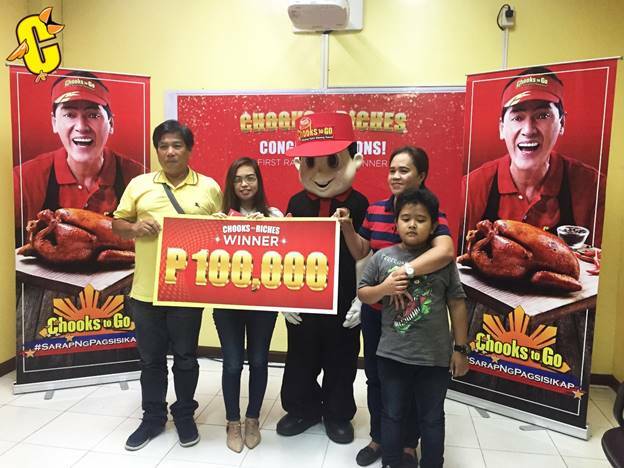 With Chooks-to-Riches, Chooks-to-Go aims to reward its loyal and hardworking customers who have been making the deliciously roasted chicken a part of the family’s everyday meals. This promo is the brand’s way to return the love, appreciation, and support that the customers have shown Chooks-to-Go. To qualify for the promo, customers must make a single receipt purchase of at least one (1) whole Chooks-to-Go oven roasted chicken of any variant (Sweet Roast, Pepper Roast, Fried Chooks). To earn entries, customers need to send CHOOKS (space) <COMPLETE NAME> / <COMPLETE ADDRESS> / <OR NUMBER> / <TOTAL TRANSACTION AMOUNT> via text message to 2256. Valid receipts may be registered until August 11 to qualify for the promo. Chooks-to-Go will draw the last set of winners on August 13. Will you be one of the lucky six to win PhP100,000? Remember that the more entries you have, the more chances of winning! So what are you waiting for? Join now!